We had just spent four electrifying nights in Japan’s capital city, Tokyo. Brian and I were ready for some rest and relaxation. 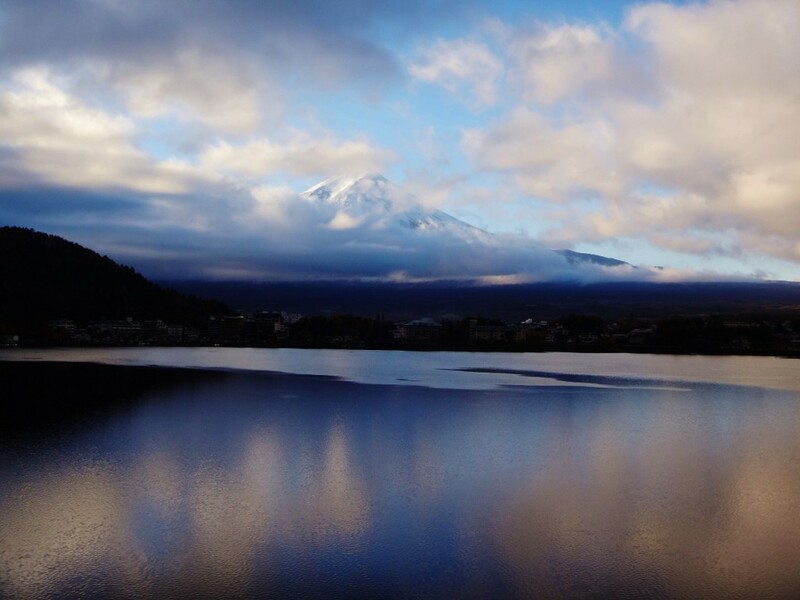 I couldn’t imagine a more perfect place to take a breather than lakeside at the base of Mount Fuji. 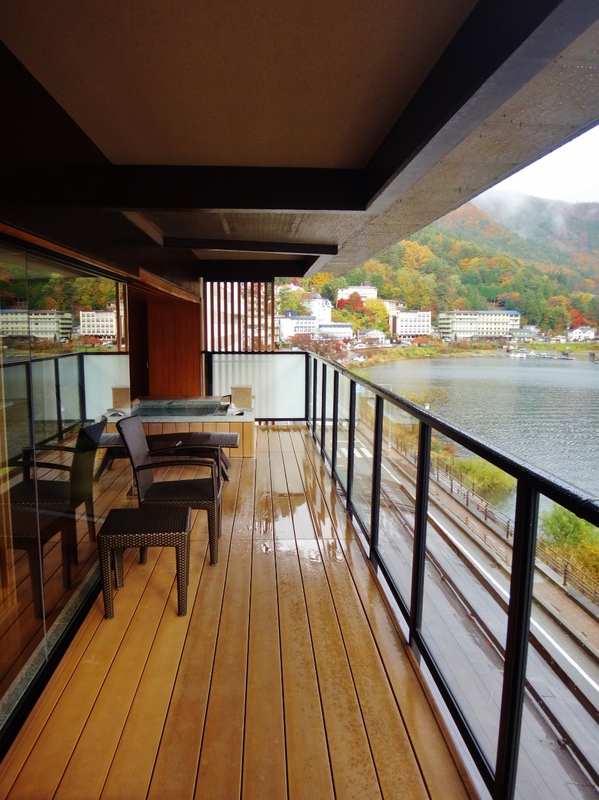 We were headed for Kozantei Ubuya, an onsen resort overlooking Lake Kawaguchiko. As a volcanically active country, Japan has thousands of onsen (hot springs) scattered across the country. Some flow to the surface while others are reached by tapping subterranean sources more than 1,000 meters underground. 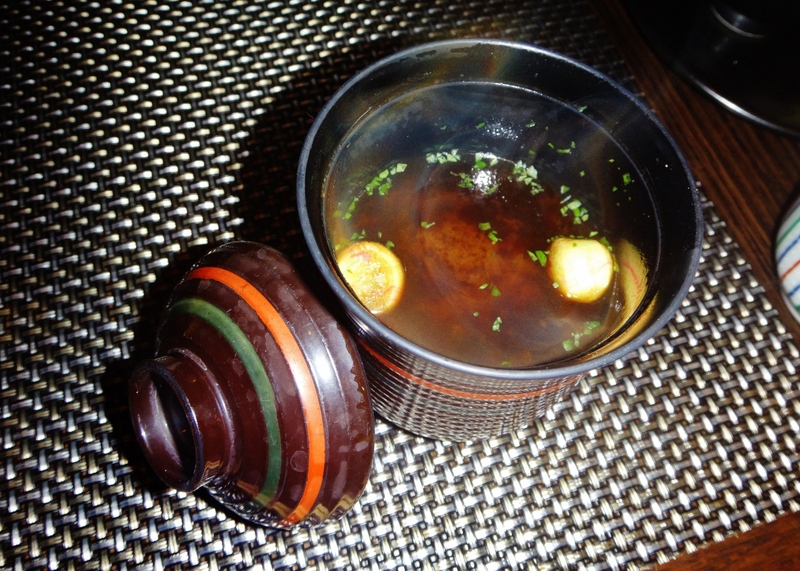 Onsen water is believed to have healing powers derived from its mineral content. Onsen bathing is an important part of Japanese culture, and one of the traditions I was most looking forward to! For those who know me well, baths are an essential part of my life. There is nothing more satisfying than soaking in a tub of steaming hot water, sipping on a glass of moscato, and unwinding after a long day of work as a rose scented bath bomb fizzles away. Only needing an overnight bag for our stay in Kawaguchiko, we decided to forward our luggage from Tokyo to our hotel in Kyoto. This turned out to be a smart decision as it took about 4 train transfers to reach the lake town of Kawaguchiko. It would have been awful to drag our giant suitcases through the stations, up and down stairs and onto the trains. 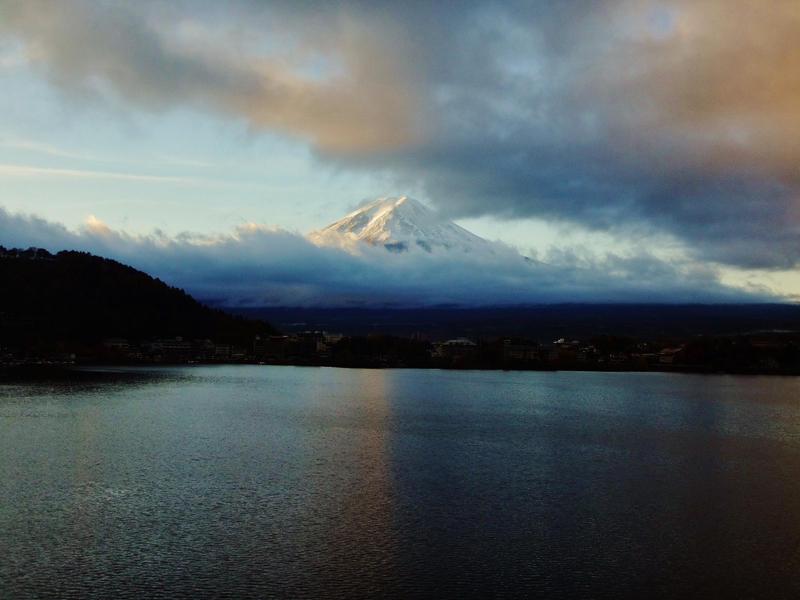 The rain faded in and out as we arrived in Kawaguchiko and my heart sank as I saw nothing but clouds hiding Mount Fuji. We only had about 24 hours in Kawaguchiko before moving on to Kyoto, and it was my mission to see the famed Fujisan mountain before I left Japan. 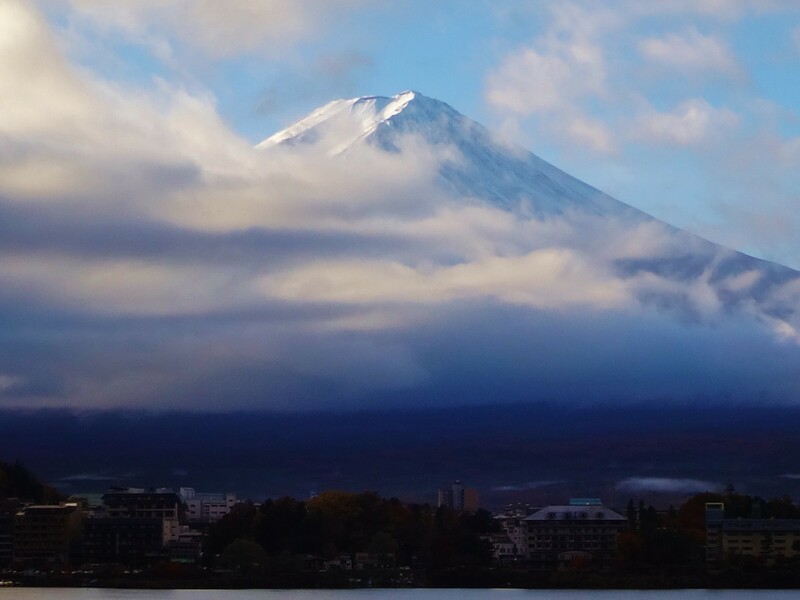 Even though Mount Fuji was being shy, the trees in this area were anything but. The trees were showing off their fall colors and it looked as though the area was on fire with brilliant reds, yellows, oranges, purples, and pinks covering the landscape. We walked over to the information center at the train station and the concierge was able to phone our hotel to send a shuttle to pick us up. After just a few minutes, we were escorted to the shuttle bus by covered umbrella. We arrived at Kozantei Ubuya, which is considered a ryokan. 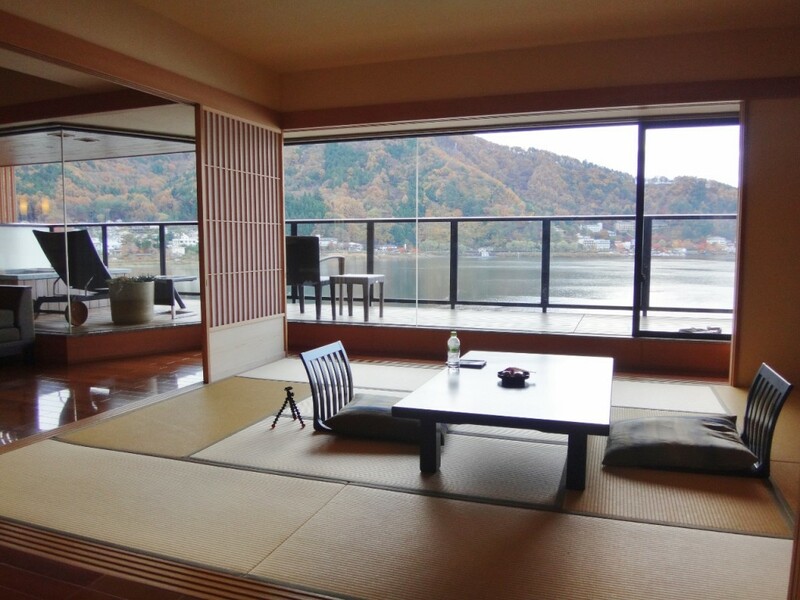 Ryokan are Japanese style inns found throughout the country, especially in onsen resorts. 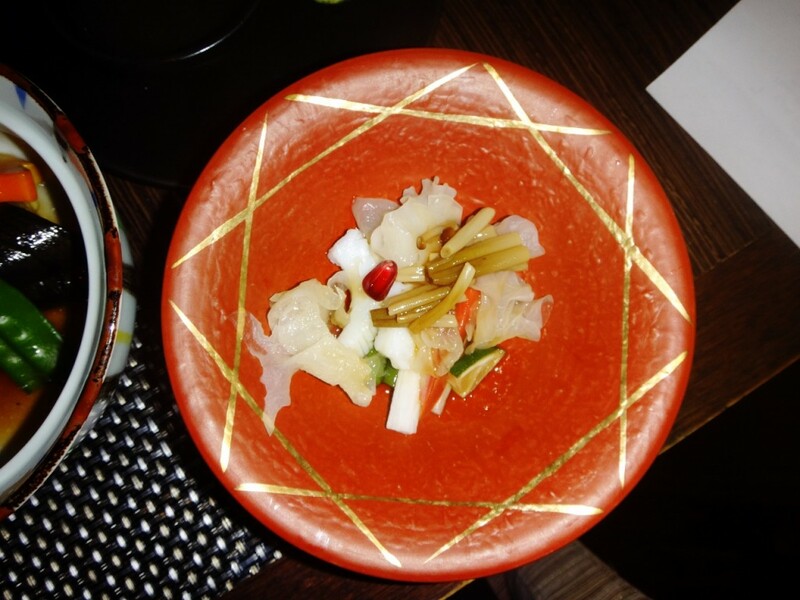 More than just a place to sleep, ryokan are an opportunity to experience the traditional Japanese lifestyle and hospitality, incorporating elements such as tatami floors, futon beds, Japanese style baths and local cuisine. 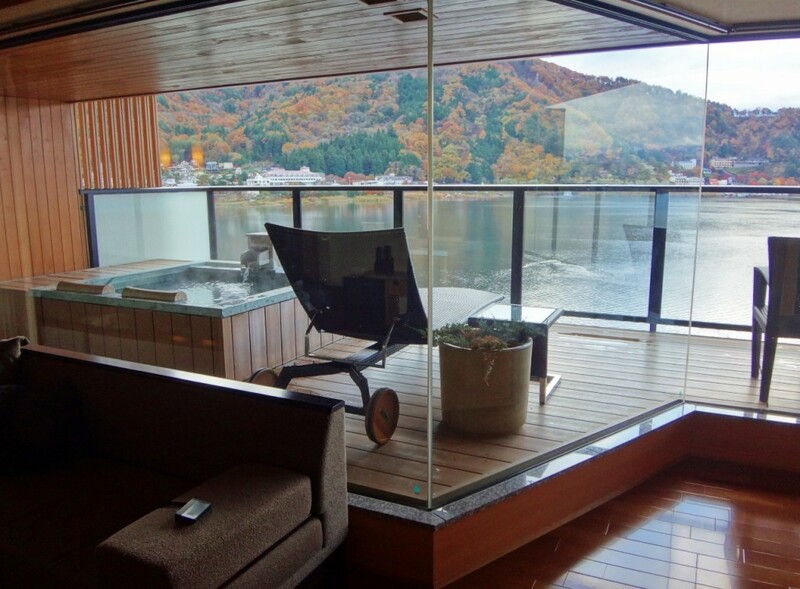 Brian and I had been saving up for our trip to Japan for over a year and we decided to splurge on the hotel’s best suite with an outdoor private onsen. 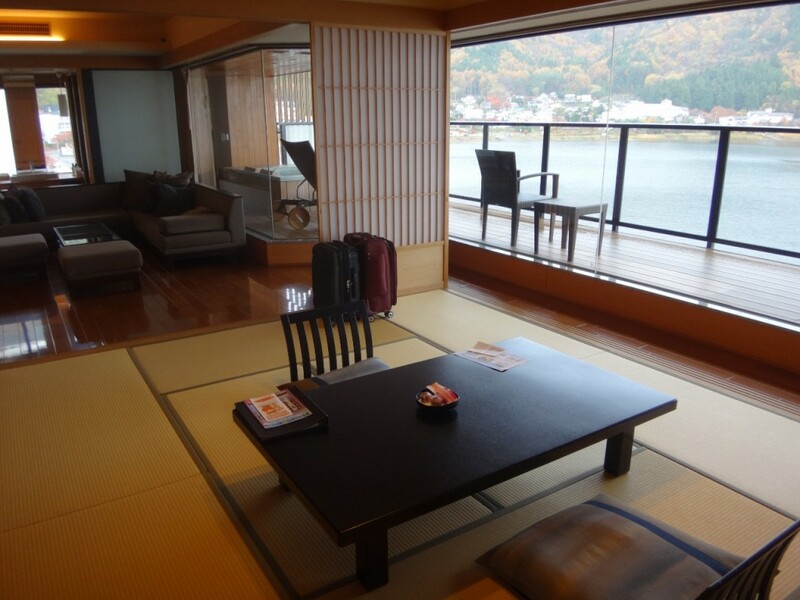 It was by far the most we had ever spent for a one night hotel stay, but in my opinion it was worth every yen. 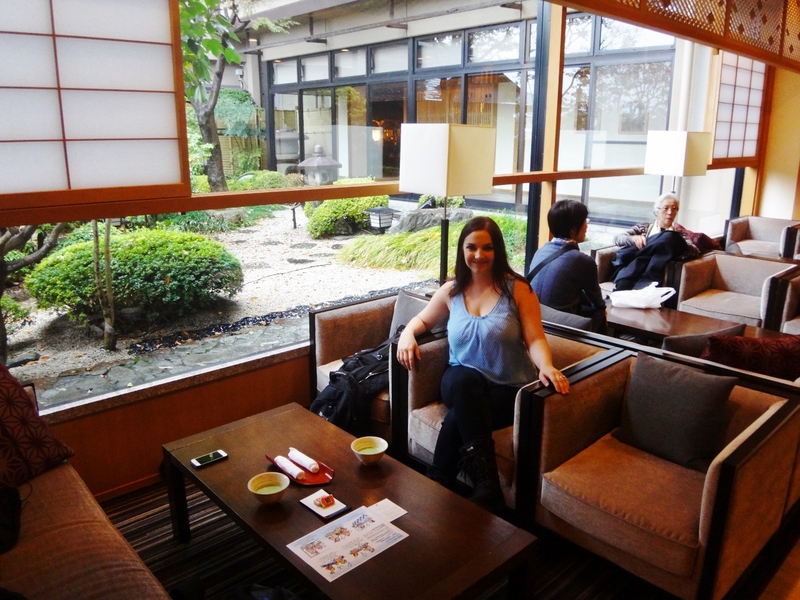 We were promptly greeted by the ryokan staff and sat down in a receiving room next to a floor to ceiling window overlooking the garden. We were given a hot cup of macha green tea (perfect for this rainy day) and a couple of tea sweets while someone went over all of our preferences with us for our stay. After reading online that this ryokan was not frequented by many tourists and that the staff’s English was minimal, I was pleasantly surprised by how well our greeter communicated with us. We were then escorted to our suite and had to remove our shoes in the hallway before entering the room. My jaw dropped and my eyes opened wide – I was blown away by the beauty and size of the room. At 98 square meters (close to 1100 square feet) the room was almost the size of our house in Arizona! 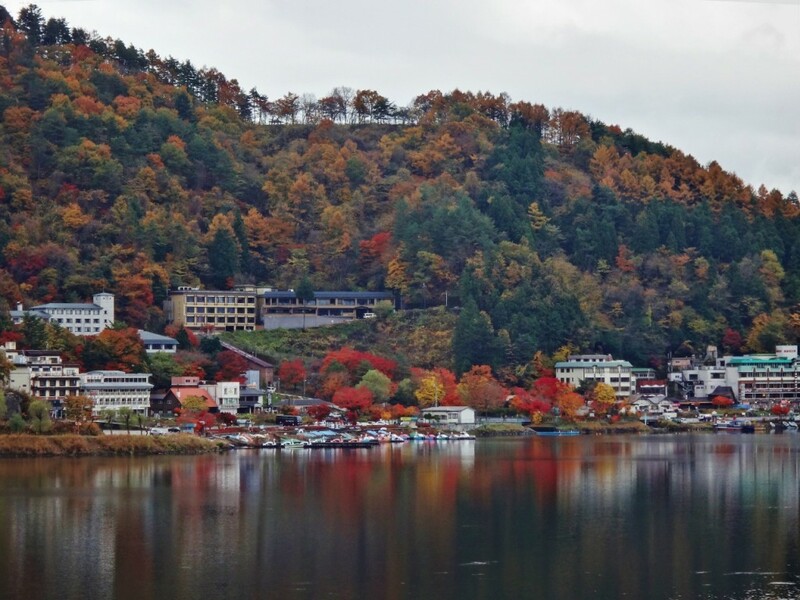 The first thing we noticed was the breathtaking view of Lake Kawaguchiko and the surrounding hills speckled with fall colors. The entire back wall of the room was floor to ceiling windows that gave the feeling of being outside when we were inside. There was a very sleek western style living room equipped with an L-shaped couch and giant flat screen TV (which we never turned on because we couldn’t take our eyes off the view!). 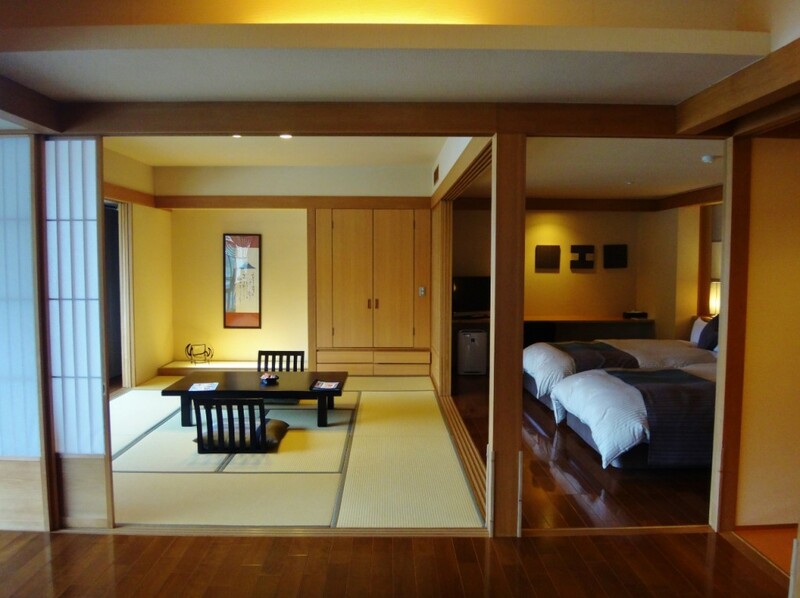 A separate bedroom area opened up to the living room and a traditional Japanese dining space. As we opened the sliding glass doors to a full length balcony we noticed some wooden shoes for us to use outside. 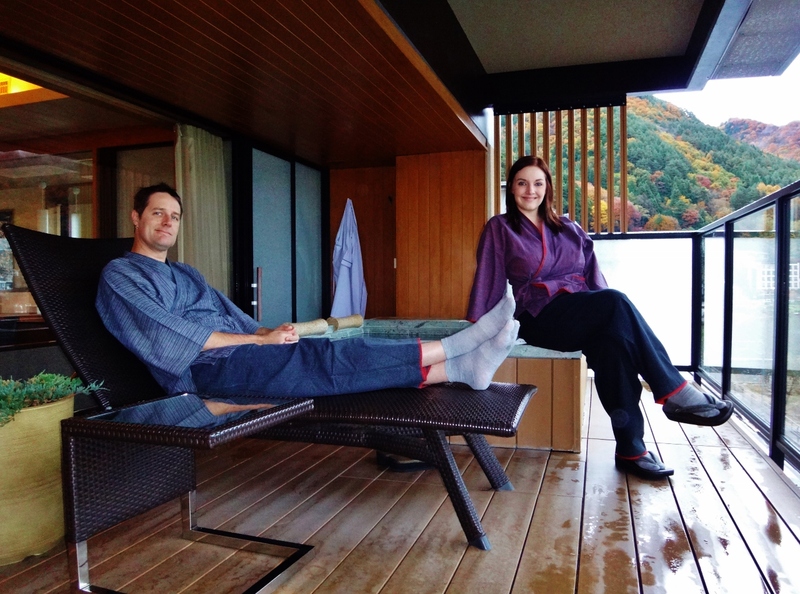 The hotel staff showed us our private outdoor onsen which was giving off steam on this cold November day. I could not wait to take a dip! 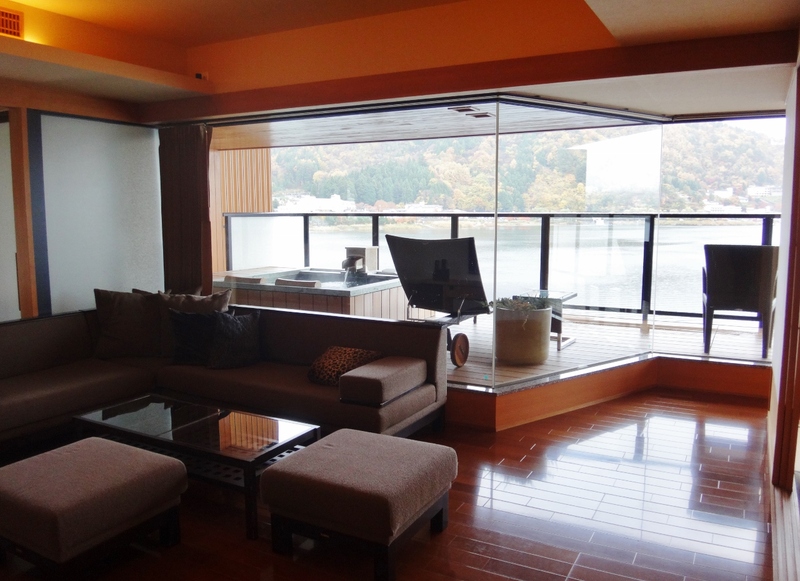 We were also shown the shower which had an inside entrance and an outside entrance near the onsen. We were given a paper that described proper bathing etiquette for the onsen, in which you must shower first before entering the bath (hence the shower door that opened onto the patio). 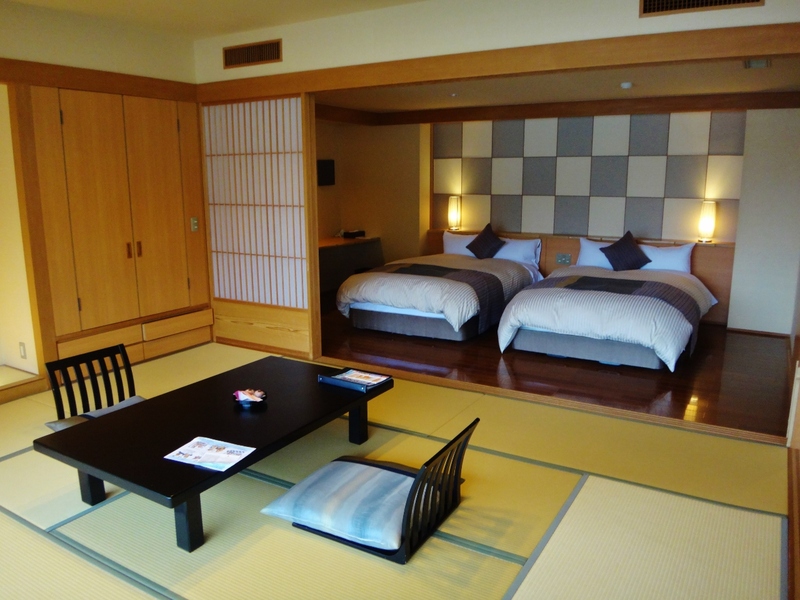 The suite was very contemporary while keeping the charm of a traditional ryokan room. 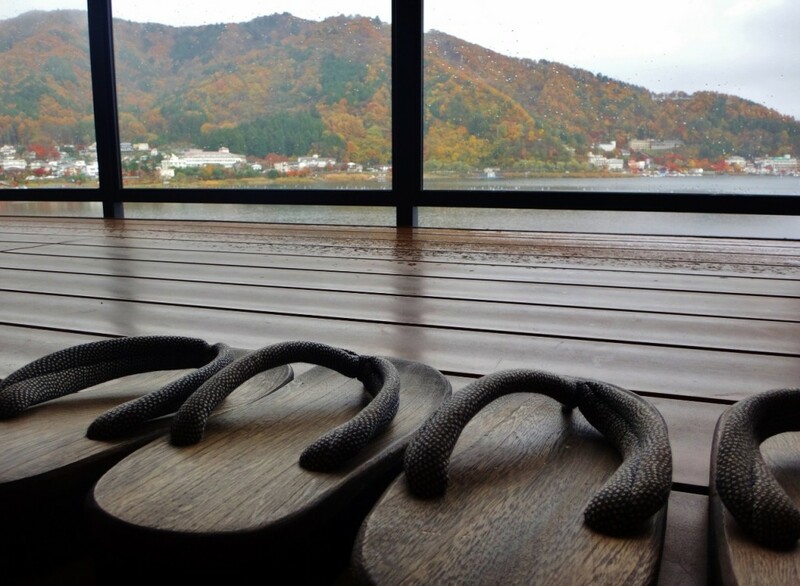 TRAVEL REVIEW: Onsen Bath Trip Highlight! 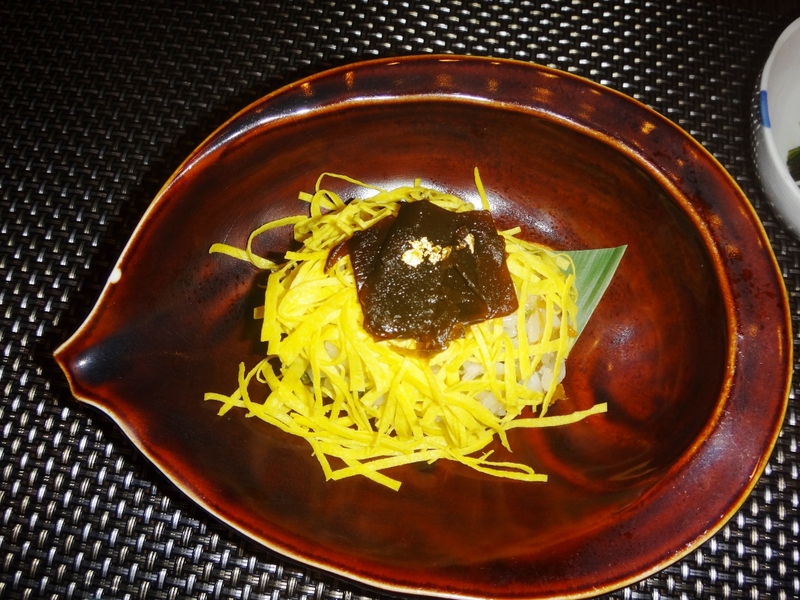 The price of the room included a traditional multi-course kaiseki dinner and an elaborate breakfast. 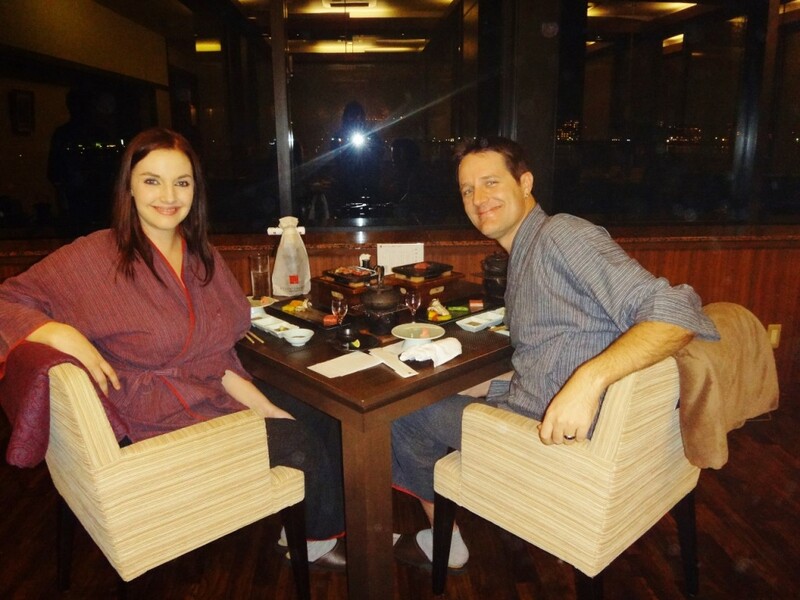 After relaxing in our room for a few hours we changed into a traditional robe and pants given to us by the hotel and we headed down to the dining room. We were escorted to our dinner table which was next to a window overlooking the lake. Our appetizer course was waiting for us at the table along with a printed menu of our courses. For anyone that has known me even for a short time, they know that I am a picky eater. And I don’t mean “don’t-like-tomatoes-picky” (although I don’t like those either). I mean the list of foods I do like is shorter than the list that I don’t like. I don’t like leftovers because they get too soggy, I only started eating green foods a few years ago, I only eat beef cooked medium rare and I won’t eat fish unless its well done (I’m not down with the slime), I don’t like sandwiches because there are far too many ingredients, I don’t like all my food touching on one plate, and whatever you do – do NOT mix sweet and savory! Well, as you can imagine, my stomach turned at the thought of this menu. My appetizer was sitting there waiting but I could not identify a single thing on the plate. I didn’t know where to start and to be honest, I was afraid to start. I picked up my chopsticks and started poking the food. After some encouragement from Brian, I tried something. And then I tried another something. And then another. I’m proud to say that I ate everything on my plate, and even enjoyed most of it! 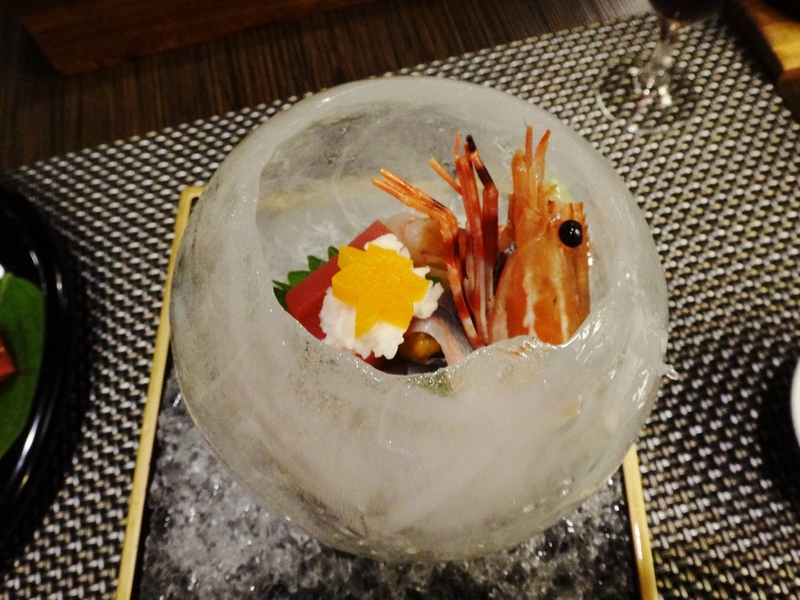 When I thought I had made it through some pretty difficult food, our server came out with a stunning bowl made of ice. Was mesmerized by this spectacular presentation…until I saw these two little eyes peering up at me. No way was I eating THAT! 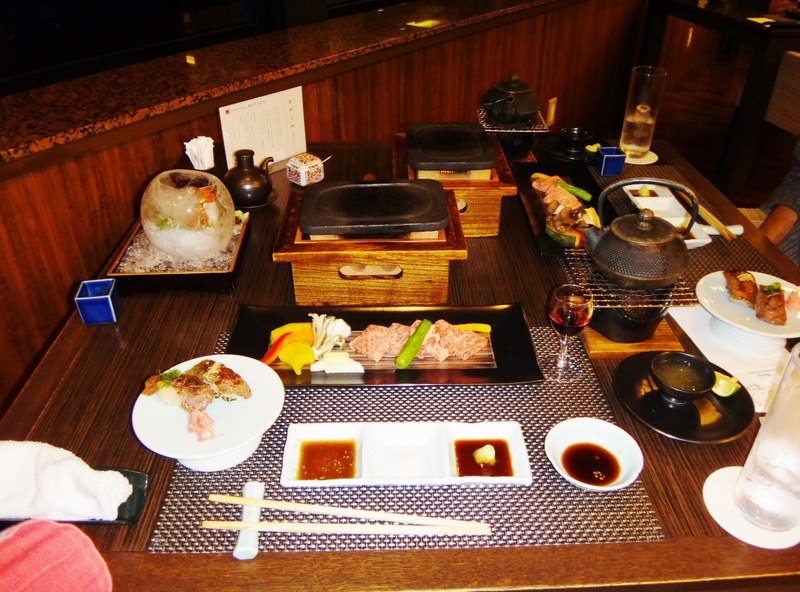 Our meal was served with a small glass of Japanese wine and hot green tea. 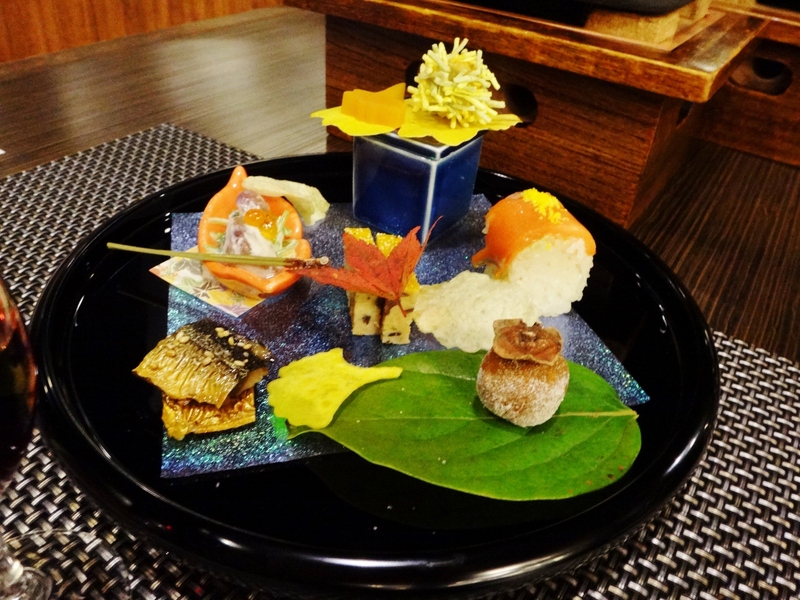 Each dish was stunningly crafted and extravagantly decorated – it almost looked too beautiful to eat. 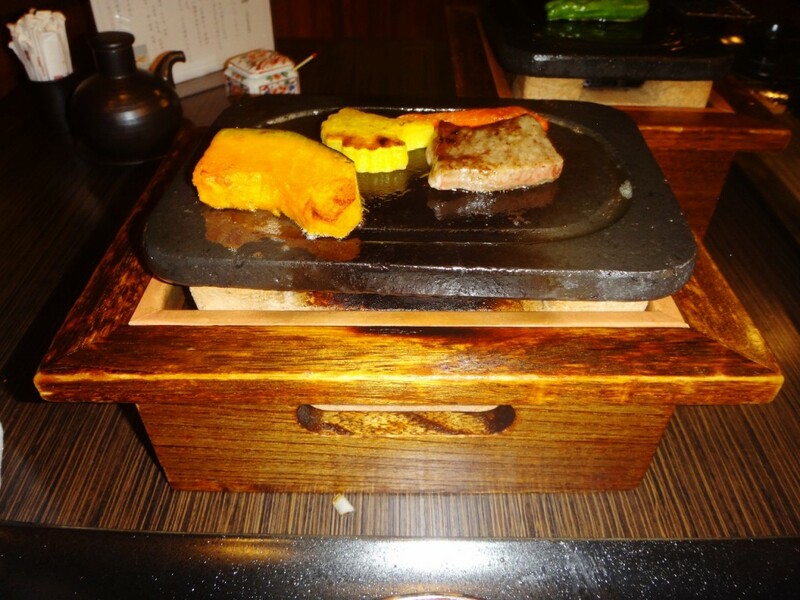 It was my first time having Kobe beef and it was both delicious and fun grilling the beef myself on the hot griddle at our table. 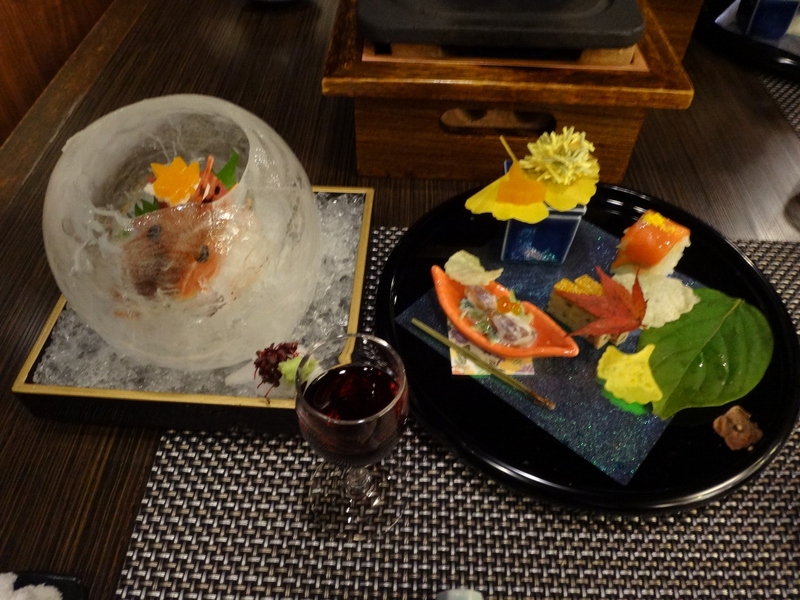 The most beautiful dish was the sashimi served in sphere bowl made of ice – it was the most amazing food presentation that I had ever seen. We tried many new things, most of which we enjoyed and some of which our taste buds did not agree with. Overall, it was a truly memorable dining experience. 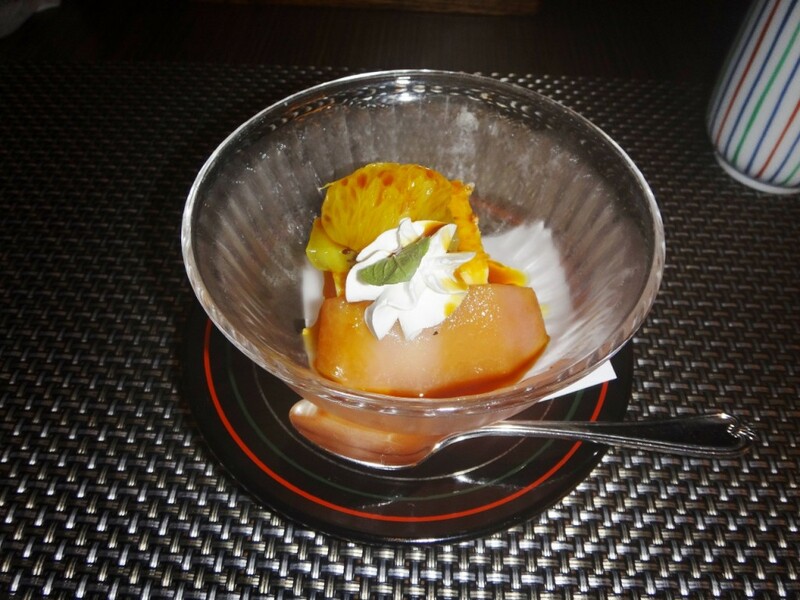 TRAVEL REVIEW: Kaiseki Dinner Trip Highlight! 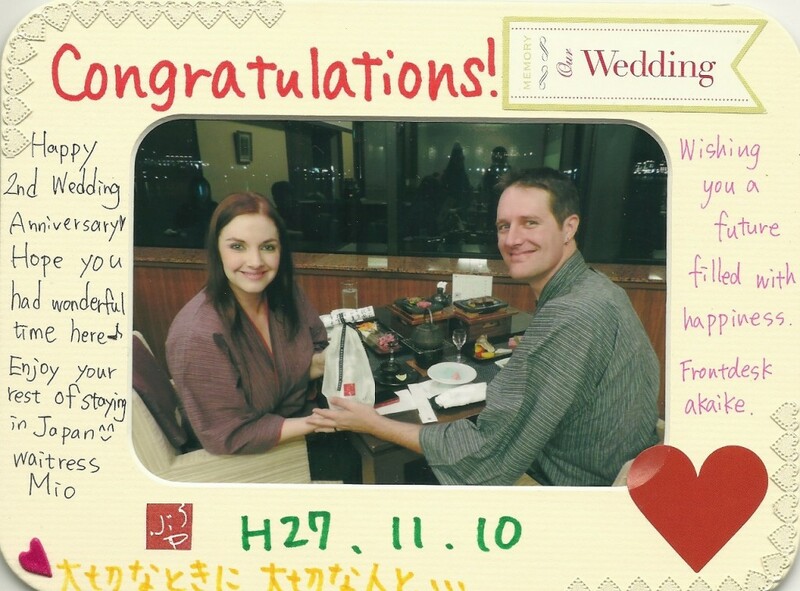 After dinner our waitress presented us with a framed photo and bottle of wine to celebrate our 2 year wedding anniversary which was just a couple of weeks away. I had read somewhere that the likelihood of seeing Mount Fuji increases in the early morning and towards the evening. Since we had such foggy weather the day before, I woke up before sunrise to get my chance at seeing the famous Fujisan. As the sun started to rise I could just make out the outlines of the perfectly symmetrical mountain. I excitedly woke Brian up and we waited in our private outdoor onsen on the patio for daybreak. We ended up getting an amazing 45 minute view of Fujisan before the mountain slipped back behind the clouds. I was so happy to have gotten such a magnificent view of the iconic mountain with its snowcapped peak. It was beautiful. With Mount Fuji checked off the bucket list, we headed downstairs for breakfast. 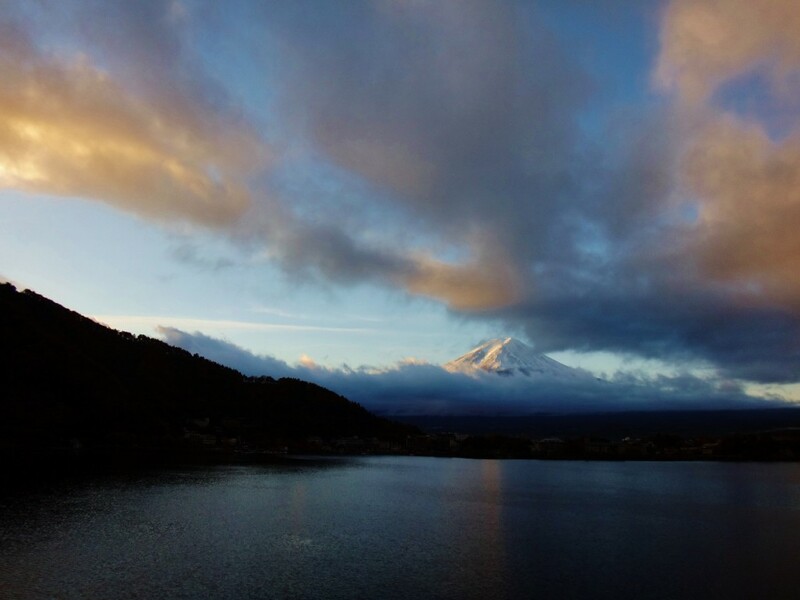 TRAVEL REVIEW: Mount Fuji Trip Highlight! 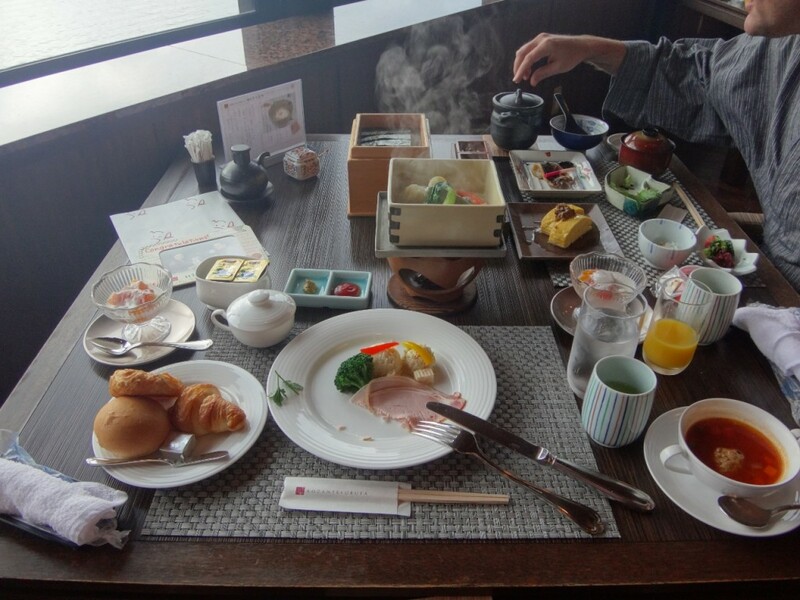 We had the option of ordering either a Japanese breakfast or a Western breakfast. We decided to order one of each just in case the Japanese breakfast was too out of our comfort zone. I ended up eating most of the western breakfast which included delicious pastries, fruit, soup, and scrambled eggs. Brian was very pleased with the Japanese breakfast, and although we couldn’t identify many of the courses, he definitely enjoyed it. After breakfast we retreated back to our beautiful room to enjoy our last few hours of the ryokan before checking out at 10am. 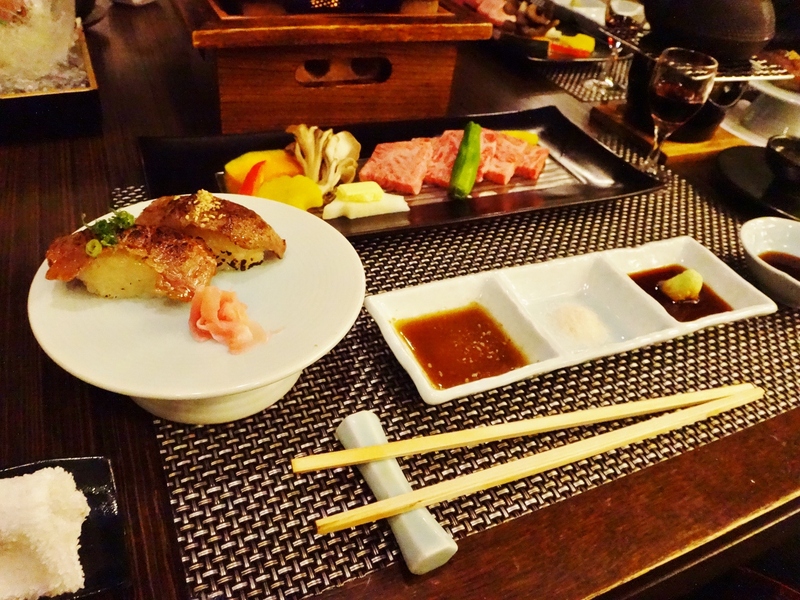 TRAVEL REVIEW: Kozantei Ubuya Ryokan Trip Highlight! Congratulations on your anniversary. What an amazing experience. The suite and meals all look fabulous, and it would be hard to beat that view anywhere. 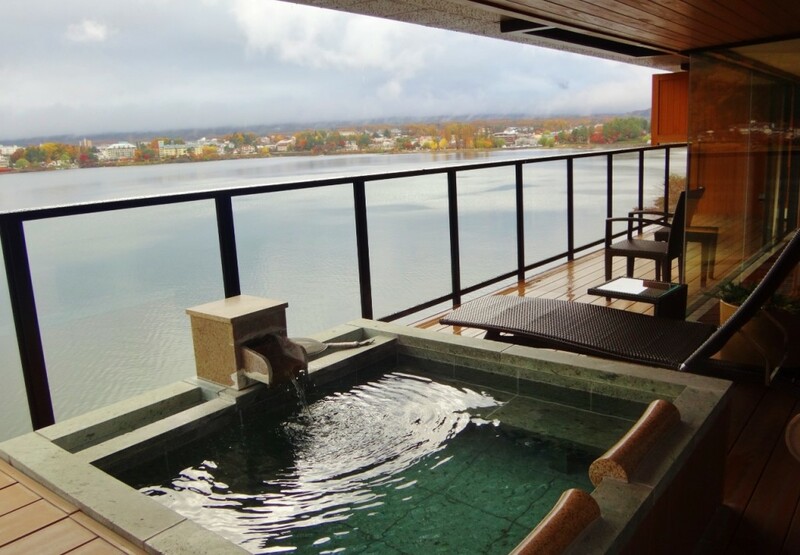 Did you enjoy having the onsen on the deck,, I love the idea of it being outside and private, but did it feel a bit exposed being open to the lake? Hi Toni! 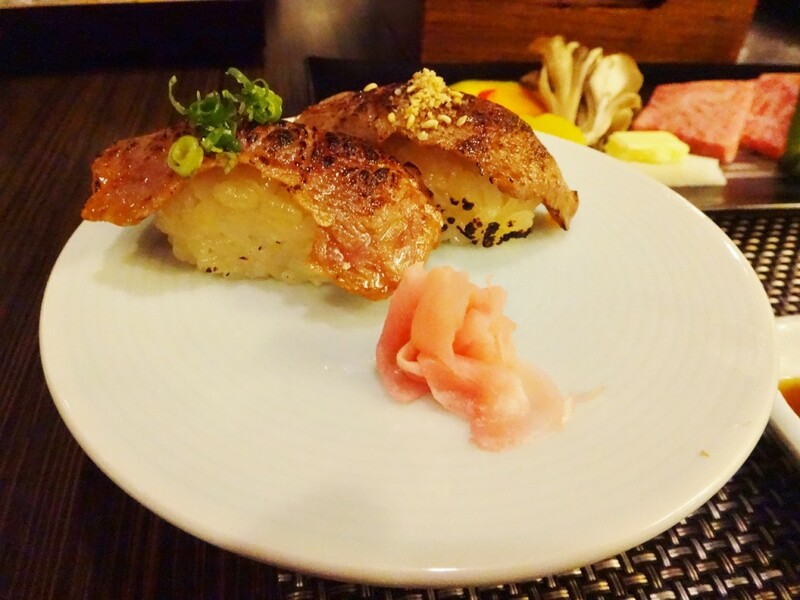 Thanks for the comment 🙂 To say the ryokan was amazing would be an understatement! 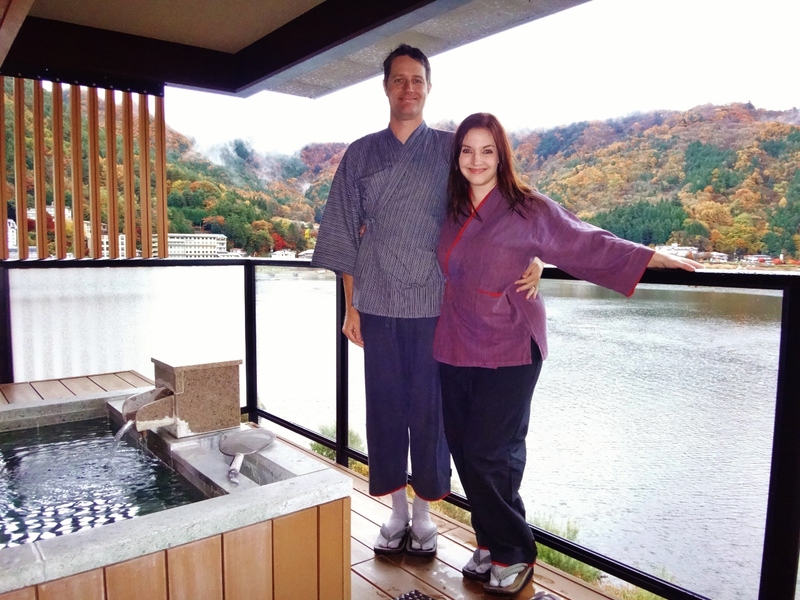 It was one of the highlights of the trip for me – not just for the view and luxurious space, but for the traditional Japanese Inn experience. 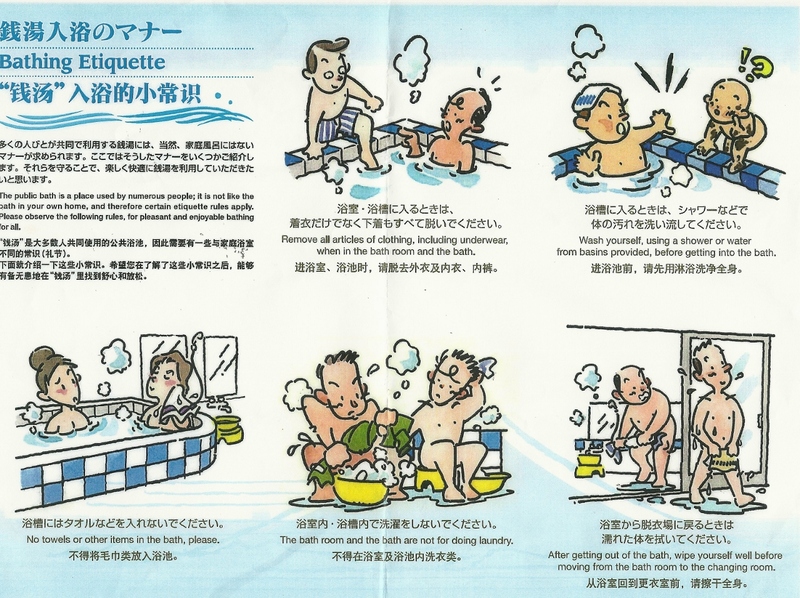 I was worried about feeling exposed in the outdoor onsen, but public bathing is something the Japanese culture embraces so I set my fears and worries aside. Fortunately though, the onsen was secluded and situated perfectly on the deck for privacy. 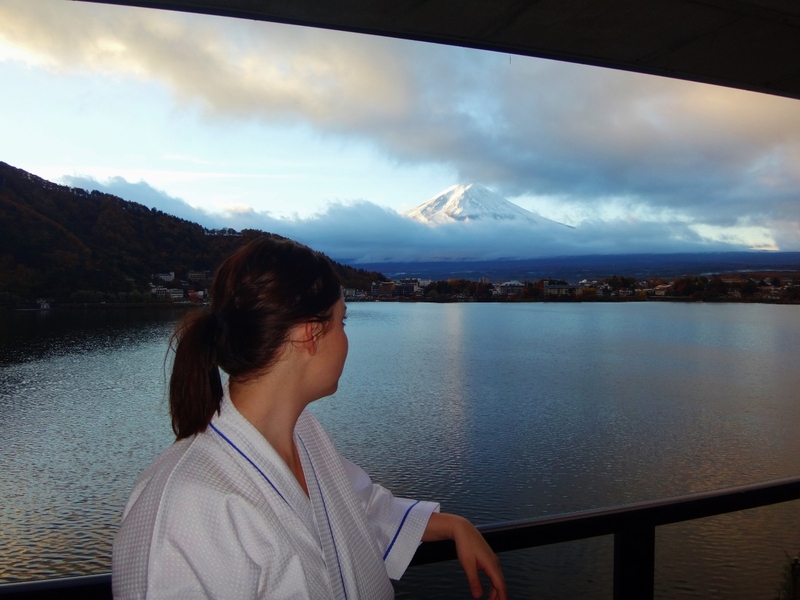 And there was nothing more relaxing than a steaming hot onsen bath during a crisp November morning watching Mt Fuji at sunrise! Wow this is the best blog so far – lots of great info and pics! My wife and I are looking at the same trip, Tokyo to Fuji for one night then to Kyoto. The trip from Fuji to Kyoto seems pretty long and tenuous. Like a 2 hour bus ride back to Tokyo then a 3.5 hour train to Kyoto? Is this the same route you took? Was it a rough trip or was it enjoyable and comfortable? Thanks for sharing. Hi! 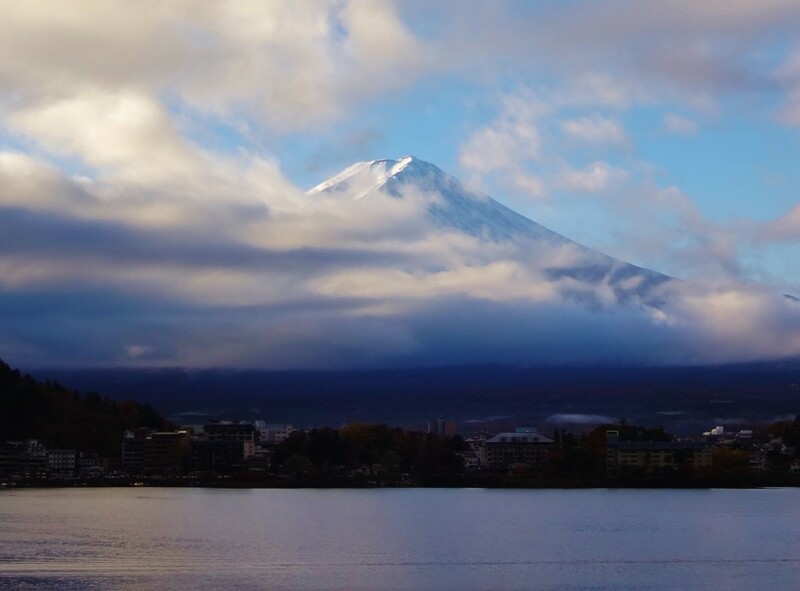 A stop near Mt Fuji is a great way to break up the journey from Tokyo to Kyoto. 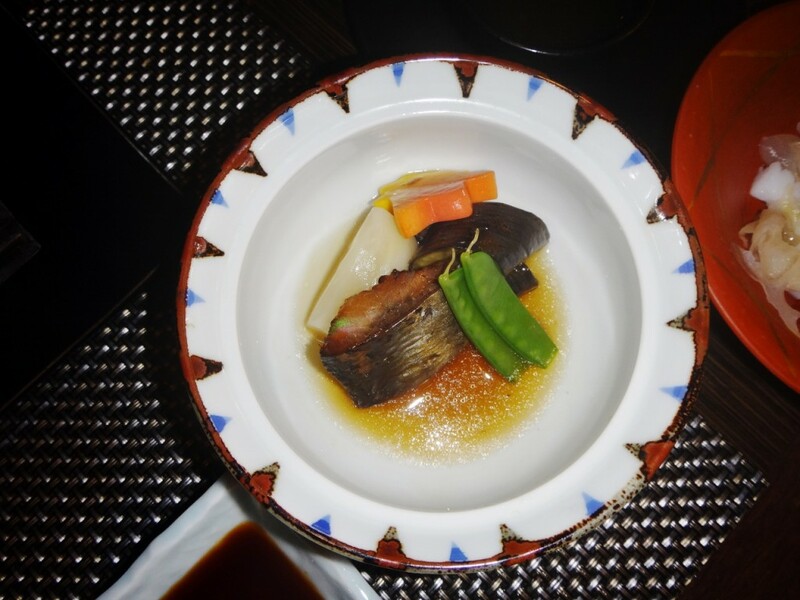 While Hakone is definitely easier to get to, we wanted to get out of the touristy area and closer to the mountain where we could experience a true Ryokan experience – so we chose Kawaguchiko. Getting there wasn’t as hard/bad as it seems. We left Tokyo by about 9am and were in Kawaguchiko by noon (took less than 3 hours). I believe we took a train from Tokyo to Otsuki and then took the Fujikyu Railway to Kawaguchiko (just 1 train transfer). Very easy. It took us about 4 hours to get from Kawaguchiko to Kyoto – we took the Fujikyu Railway back to Otsuki and then a train to Yokohama where we caught the bullet train to Kyoto (so 2 train transfers). We left Kawaguchiko by about 11am and arrived in Kyoto at about 3pm. I wouldn’t consider it a rough trip – we found it to be fairly easy and the bullet train was an enjoyable experience as well. It was 100% worth the little bit of extra work to get to Kawaguchiko! We used the HyperDia website to help us with all of our train travel in Japan – it is a great resource.